Yes, it’s odd to argue that a party is better served by an incumbent retiring rather than running for another term in an institution where more than nine in 10 members who run for reelection are reelected, but Bachmann is no ordinary incumbent. The suburban Twin Cities Republican has always been controversial, and her image as the “Queen of the Tea Party” (as dubbed by the Weekly Standard) has proven to be a liability even in MN-6, the most Republican district in Minnesota. Only four Republican members of the House ran further behind Mitt Romney in their districts in 2012: three freshmen members and two-term Rep. Scott DesJarlais (R, TN-4), another incumbent with problems. Bachmann barely won reelection last year against wealthy Democratic businessman Jim Graves in 2012, and she was in for a tough rematch this time, particularly because she now has ethical and legal questions to go along with her highly polarizing image. Perhaps Republicans will nominate a weak replacement candidate in MN-6, but for the time being we expect the eventual nominee to be closer to a generic Republican than the lightning rod Bachmann. And being a generic Republican in a district where Mitt Romney won 56.5% of the vote should be more than enough to triumph in 2014 and beyond. Graves told reporters Wednesday he will not run in another district, but if he changed his mind he could consider challenging one of two Republican incumbents who hold swingier districts in the greater Minneapolis/St. Paul area. Reps. John Kline (R, MN-2) and Erik Paulsen (R, MN-3) occupy turf that President Obama narrowly won in 2012, and if Graves could beat one of them, he would have a better chance of surviving for more than just one term. As of now, Kline looks set to face a rematch against Mike Obermueller (D), a former state legislator, while Paulsen does not yet appear to have a serious challenger. Remember that candidates for the House do not have to live in their districts — they just have to live in the state they represent — so Graves has options if he wants to run for a different seat. Bachmann is the first member of the House to announce her retirement this cycle without also planning to resign or seek another office; last cycle, the first true “retirement” came almost exactly two years ago, when then-Rep. Dan Boren (D, OK-2) announced in early June that he would not be seeking another term. There will be many more retirements to come, and — just as is the case with Bachmann — those retirements will in some cases affect our Crystal Ball House ratings. Last week, we discussed the relationship between the politics of a congressional district and its size, noting that the largest districts are mostly represented by Republicans while the smallest districts are mostly represented by Democrats. We expressed surprise that there wasn’t a stronger negative correlation (only R = -.35) between the size of each district and President Obama’s 2012 district-by-district performance. However, reader Matt Dabrowski suggested that rather than use the raw district area, we ought to use the logarithmic size of the districts. Because of the incredible size range of congressional districts (stretching from roughly 10 square miles to the entire state of Alaska), it’s very hard to adequately scale them. Instead, taking Matt’s suggestion, we can greatly reduce the range of the scale by finding the logarithm of each district’s land area. So instead of having a range of hundreds of thousands of square miles, we are left with a range of only about one to six. With such a large range of data points, it’s the perfect time to use a logarithmic scale. 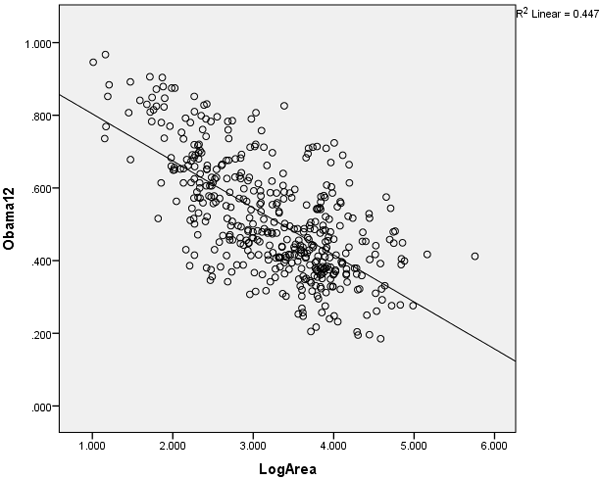 Below is a simple regression of Obama’s performance by congressional district and district log size, which has a much stronger negative correlation (R = -.67) than our original finding. In other words, there is a fairly strong correlation between the size of a district and its partisan leanings: The bigger districts are more Republican, and the smaller districts are more Democratic.